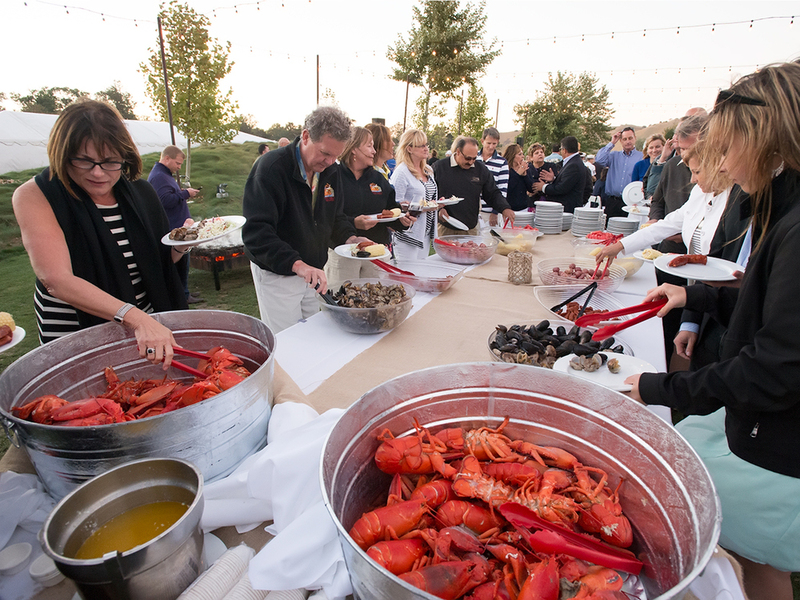 The LVPAC hosted the First Annual Lobster Clambake fundraiser supporting visual and performing arts in the Livermore Valley. The event was held at Wente Vineyards in Livermore and the fresh seafood was provided by Sam's Chowder House out of Half Moon Bay. One of the challenges that faces a photographer in this kind of an event are the elements. With wind and harsh sunlight you have to be patient. Lobsters getting ready for the cook. Shooting closeups of detail items can be shot in advance, where you can control the direction of the light. Many times however, you will need to be prepared to shoot like crazy when the sunlight falls behind the hills enough to have well lighted photographs. As far as the wind, sometimes there is nothing you can do about that but shoot it's effects. Some folks had a creative way to guard themselves from the windy conditions. To get good overhead shots, use a monopod and remote fire the camera with either a remote trigger or using the self-timer on the camera. If you use a wide angle lens, set the lens for a wide depth-of-field and estimate focus your shots should be fine.